STRASBOURG, France (BBC)—Europe’s top human rights watchdog, the Council of Europe, has launched an investigation into alleged corruption at the council involving Azerbaijan. The criticisms concern some members of the Parliamentary Assembly of the Council of Europe (PACE), accused of doing favors for Azerbaijan. The oil-rich ex-Soviet state has cracked down on political dissidents. There are suspicions that Azerbaijan influenced PACE’s rejection of a report on Azeri political prisoners in 2013. Azerbaijan is among the 47 member nations of the Strasbourg-based Council of Europe. The council – not part of the EU – monitors compliance with the European Convention on Human Rights, and judges in Strasbourg enforce it. In January 2013 PACE rejected a report by German Social Democrat MP Christoph Strässer, which deplored human rights abuses in Azerbaijan and urged the authorities there to release political prisoners. The Azeri government denies that charges against opposition activists are politically motivated. Opponents of President Ilham Aliyev have been jailed on various charges, including tax evasion, spying and weapons possession. Three top international human rights lawyers will investigate the PACE corruption allegations and will report their findings by the end of 2017. They can recommend action against any PACE members implicated in corruption. PACE elects the judges at the ECHR, whose human rights rulings are binding on Council of Europe states. As part of the inquiry, PACE plans to revise its code of conduct. An investigation published in December by the European Stability Initiative (ESI), a human rights think-tank, alleged that some parliamentarians in PACE had engaged in political lobbying for Azerbaijan. There were claims that some received Azeri payments. A large group of European MPs in PACE made a similar plea in January. They said PACE’s integrity was threatened by “recent, serious and credible allegations of grave misconduct” by some fellow MPs. I highly doubt that Turkey's free pass has ended, it's just a silly game they are playing time will tell one way or another we'll see! ANKARA, Turkey (A.W. )—Turkish Ministry of Foreign Affairs spokesperson Ambassador Hüseyin Müftüoğlu criticized the U.S. House of Representatives’ passage of H.Res.354 on June 6, which condemns the May 16 attack by Turkish President Recep Tayyip Erdogan’s bodyguards against peaceful protesters in Washington D.C. The spokesperson’s comments came on June 7 in response to a question regarding the resolution. “The steps taken by the U.S. legislative branches to distort and politicize the matter are not constructive,” said the spokesperson, who added that the resolution was against the “spirit of alliance and partnership” between Turkey and the U.S.
“Erdogan’s claiming that Congressional condemnation of the attack he ordered on American protesters runs counter to the spirit of Turkey’s alliance with the U.S.—but what he’s really voicing is his frustration that the free pass that Ankara has long enjoyed here in Washington has been revoked,” Armenian National Committee of America (ANCA) Executive Director Aram Hamparian said in his comments to the Armenian Weekly. “As much as he might like a resurrect Ankara’s old arrangements, its clear today that U.S. policy-makers—from both parties and in both the legislative and executive branches—won’t countenance a return to the days when Turkey crossed every line, confident that America would remain silent about its sins,” Hamparian added. The U.S. House of Representatives unanimously passed H.Res.354 on June 6, which called for “”the perpetrators to be brought to justice and measures to be taken to prevent similar incidents in the future.” The resolution passed with a vote of 397 for and none against. H.Res.354, spearheaded by House Foreign Affairs Committee Chairman Ed Royce (R-Calif.), Ranking Democrat Eliot Engel (D-N.Y.), House Majority Leader Kevin McCarthy (R-Calif.) and Democratic Whip Steny Hoyer (D-Md. ), was adopted unanimously by the House Foreign Affairs Committee on May 25. The measure had also received the public backing of House Speaker Paul Ryan (R-Wis.). Amnesty International's director in Turkey, Taner Kilic, was arrested on Tuesday along with 22 other lawyers. They have all been accused of links to the network of the US-based cleric Fethullah Gulen. WASHINGTON (A.W. )— United States Marshals have arrested two Turkish men living in the U.S., for their role in beating peaceful protesters outside of the Turkish Ambassador’s residence in Washington, D.C. on May 16, according to a report by The Daily Caller. The New York Times Nick Fandos now reporting that a dozen of Erdogan's security detail are set to be charged Thursday for their May 16th assault on peaceful protesters in DC. The ANCA's Aram Suren Hamparian offered this comment to the welcome news. “American law enforcement is doing its job. Now it’s time for the Trump Administration to demand that Turkey lift all claims to diplomatic immunity for those involved in this crime so that justice can be served." WASHINGTON — Law enforcement officials plan to announce charges Thursday against a dozen members of the Turkish president’s security detail for their involvement in a brutal attack on protesters outside the Turkish ambassador’s residence here last month, two American officials said on Wednesday. Authorities have already charged several others, including two Americans and two Canadians, with taking part in the violent skirmish. The Washington police have been investigating the May 16 incident along with the State Department and the Secret Service. The police planned to announce the charges at a news conference on Thursday morning, according to the two officials, who spoke on the condition of anonymity to discuss the charges before they were made public. Lawmakers from both parties on Capitol Hill, as well as a smattering of advocacy groups, have clamored that those responsible for the assault be prosecuted. Last week, the House unanimously passed a resolution condemning the attack and calling for charges against the security forces. In calibrating its response, though, the Trump administration has had to tread carefully, navigating a web of diplomatic and military concerns with a key NATO ally. The incident appears to have already stalled a proposed $1.2 million small-arms sale to Turkish security forces that was moving toward approval by the State Department last month. And then there was the added wrinkle that the entire security detail for President Recep Tayyip Erdogan of Turkey had left the country with him just hours after the incident. Members of the security team face several felony and misdemeanor counts, the American officials said. It is highly unlikely that Turkey would extradite the men to the United States to face the charges, but they do face the possibility of arrest should they ever try to re-enter the country. “Any further steps will be responsive and proportional to the charges,” the department said. The Turkish Embassy here did not immediately respond to requests for comment. In a statement in the days after the incident, the embassy said that anti-Erdogan protesters had caused the violence by “aggressively provoking” Turkish-American citizens who had gathered to greet the president and who responded in self-defense. The statement did not mention the security forces. The run-in was not the first time Mr. Erdogan’s bodyguards have become violent while visiting the United States. In 2011, they took part in a fight at the United Nations that sent at least one security officer to the hospital. And last year, the police and members of Mr. Erdogan’s security team clashed with demonstrators outside the Brookings Institution in Washington. But the latest case, which played out in broad daylight along Washington’s genteel Embassy Row, has brought a much higher level of attention. Videos streamed live from the scene (and later spread across social media) showed armed guards storming a small group of peaceful, anti-Erdogan protesters in plain sight of federal and local law enforcement officers. A chaotic and bloody scene followed in which the guards, the protesters, pro-Erdogan civilians and American law enforcement tangled on the street and in a nearby park. Nine people were eventually hospitalized, some with serious injuries. The New York Times, after analyzing videos and photos from the scene, identified at least 24 men, including armed Turkish security forces, who had attacked protesters. Another video shows Mr. Erdogan watching the attack play out from a Mercedes-Benz sedan parked a few yards away. His role in the clash, if any, is unclear. Diplomatic security officers protecting the delegation also temporarily detained two members of the Turkish forces who had assaulted them, before it was determined that the guards had diplomatic status and were freed. WASHINGTON (A.W. )—During a press conference on June 15, Washington D.C. Mayor Muriel Bowser and D.C. Police Chief Peter Newsham announced that arrest warrants have been issued for the arrest of 12 members of Turkish President Recep Tayyip Erdogan’s security detail and Turkish police officers in connection with the May 16 attack on peaceful protesters in front of the Turkish Ambassador’s residence in Washington, D.C. Yesterday, it was reported that United States Marshals had arrested two Turkish men living in the U.S., for their role in beating peaceful protesters on May 16. Two arrests of Turkish-Americans Eyup Yildirim—an owner of a construction company in New Jersey—and Sinan Narin—a Virginia resident—were made by law enforcement officials. Yildirim was charged with felony Assault with Significant Bodily Injury, felony Aggravated Assault, and misdemeanor Assault or Threatened Assault in a Menacing Manner, while Narin was charged with felony Aggravated Assault and misdemeanor Assault or Threatened Assault in a Menacing Manner. According to a Washington D.C. Police Department press release, a total of 18 individuals have been charged or are facing charges. Photographs of the 14 individuals, including Turkish security officers, who have outstanding warrants for their arrests, were also released by D.C. Police. In response to a question from the Armenian Weekly, D.C. Police Chief Newsham acknowledged that investigators are looking into the role of Turkish President Recep Tayyip Erdogan in the May 16 attack, but indicated that, despite the available video and other evidence, there is not yet sufficient probable cause to seek his arrest. “As I’ve said before, I condemn this attack. It was an affront to our values as Washingtonians and as Americans and was a clear assault on the First Amendment. As Americans, the First Amendment grants us the right to assemble and protest peacefully, and here in D.C., we are committed to safeguarding and protecting that right,” Mayor Bowser said during the press conference. She then thanked the U.S. Secret Service, the U.S. State Department, and the D.C. U.S. Attorney for their cooperation with the Washington D.C. Police Department. “I just want to be perfectly clear that we take our position in the United States as the nation’s capital very seriously. We host demonstrations month-to-month. We host millions of people who come to the seat of their government to protest peacefully. We support them, we make sure that they are safe, but we also make sure that they follow our laws. Certainly anyone travelling to the United States will be held to that same standard. We will defend the First Amendment and we will make sure that our laws are being enforced,” the Mayor added. “The May 16th Erdogan-ordered attacks on peaceful protesters in Washington D.C. were not only a brutal assault on American citizens but on our fundamental first amendment rights to freedom of speech and freedom of assembly,” Armenian National Committee of America (ANCA) Executive Director Aram Hamparian said, following the June 15 announcement. “We commend the efforts of Mayor Bowser, Chief Newsham, and all the law enforcement agencies involved in bringing the perpetrators to justice, and look forward to continuing to work with them to identify all involved. Law enforcement is doing its part; now it’s time for the Trump Administration to take action and demand that Turkey lift any claims to diplomatic immunity for those involved in this crime, so that criminal proceedings can move forward and justice can be served,” Hamparian added. Rep. Adam Schiff (D-Calif.) commended the Washington D.C. Police Department and applauded the decision to follow up with the filing of criminal charges. “This sends an important message that while violence and repression have become the norm in Erdogan’s Turkey, they remain unacceptable here. Bringing these thugs to justice will ultimately require the State Department to prioritize this issue with Turkey, and I will be urging them to ensure that those charged today face justice,” Schiff said in a statement. WASHINGTON—Metropolitan Washington D.C. police made two arrests in the case of the May 16 beatings of peaceful protesters, but stopped short of leveling charges against the Turkish President Recep Tayyip Erdogan’s security detail that led the brutal attack, reported the Armenian National Committee of America (ANCA). Turkish American businessman Eyup Yildirim was among two arrested by Metropolitan Washington D.C. Police in conjunction with the May 16 Erdogan-ordered beating of peaceful protesters. The New York Times had identified Yildirim among the attackers in a June 4th expose. According to The Daily Caller’s Chuck Ross, Turkish Americans Eyup Yildirim, an owner of a construction company in New Jersey, is charged with assault with significant bodily injury and aggravated assault while Sinan Narin, a Virginia resident faces an aggravated assault charge. “We remain deeply troubled—nearly a month after this unprovoked assault by a foreign government on peaceful U.S. protesters—over the lack of criminal charges against Erdogan’s security detail and the failure of the Trump Administration to demand that Ankara waive its claims to immunity for all those involved in this assault on our American freedoms,” said ANCA Executive Director Aram Hamparian. “These two arrests are a good start, but this is about far more than crime enforcement. It’s about our U.S. government standing up against foreign attempts to silence dissent by American citizens. In light of the major media attention devoted to this outrage and given the intense Congressional concern about its consequences – it is unacceptable that the White House and State Department have demonstrated such weakness, adopting, basically, a business-as-usual approach in the face of a brazen, angry, and arrogant foreign attack on peaceful protesters on American soil,” concluded Hamparian. Hamparian was videotaping live at the scene of the May 16 attack, which took place in front of the Turkish Ambassador’s residence where President Erdogan was scheduled to have a closed-door meeting with representatives of The Atlantic Council, a leading think tank in Washington, D.C., which receives funding from Turkey. Hamparian’s video showed pro-Erdogan forces crossing a police line and beating peaceful protesters—elderly men and several women—who were on the ground bleeding during most of the attack. Virginia resident Sinan Narin was among two arrested by Metropolitan Washington D.C. Police in conjunction with the May 16th Erdogan-ordered beating of peaceful protesters. The New York Times had identified Narin among the attackers in a June 4th expose. On June 6, with a vote of 397 to 0, the U.S. House of Representatives unanimously condemned Turkey in response to the attacks, taking a powerful stand against Ankara’s attempts to export its violence and intolerance to America’s shores. H.Res.354, spearheaded by House Foreign Affairs Committee Chairman Ed Royce (R-Calif.), Ranking Democrat Eliot Engel (D-N.Y.), House Majority Leader Kevin McCarthy (R-Calif.) and Democratic Whip Steny Hoyer (D-Md. ), has received the public backing of House Speaker Paul Ryan (R-Wis.). A companion measure has been introduced in the Senate by Senator Ed Markey (D-Mass.). Senate and House members have also raised concerns about the recently announced $1.2 million sale of semi-automatic guns slated for use by Turkish President Erdognan’s security detail, many of whom participated in the May 16 attacks. Senate Foreign Relations Committee Ranking Democrat Ben Cardin (D-Md.) and House Foreign Relations Committee Chairman Ed Royce have already objected to the sale. ANCA live footage of the attack served as source video for CNN, AP, The Washington Post, The Daily Caller and other major media, transforming the violent incident into a global spotlight on Erdogan’s attempt to export his intolerance and aggression to American shores. The Sunday, June 4 edition of The New York Times featured a two-page center-spread investigative report on the May 16th attack, with online version of the coverage translated to Turkish and shared widely on social media. The report identified Yildirim and Narin as having participated in the attacks. The May 16 protest in front of the Turkish Ambassador’s residence was a continuation of a demonstration held earlier in the day in front of the White House, co-hosted by the ANCA. As President Trump met with President Erdogan. Human rights and religious rights groups were joined by representatives of the Kurdish, Yezidi, and Armenian communities to call attention to the Erdogan regime’s escalating repression against free press, the Kurdish and other ethnic communities, as well as Turkey’s ongoing obstruction of justice for the Armenian Genocide. ANKARA (A.W. )—The United States Ambassador in Ankara John Bass was by Undersecretary of the Ministry of the Foreign Affairs of the Republic of Turkey, Ambassador Ümit Yalçın, shorty after arrest warrants for a group of President Recep Tayyip Erdogan’s security personnel were issued earlier today. The charges stem from an unprovoked attack on peaceful protesters by members of Erdogan’s security detail in Washington on May 16. The statement released by the Turkish Ministry of Foreign Affairs claims that the May 16 attack would not have occurred if the U.S. authorities “had taken the usual measures they take in similar high level visits,” and claims that Turkish citizens cannot be held responsible for the incident that took place. “It has been conveyed to the Ambassador that this decision taken by U.S. authorities is wrong, biased, and lacks legal basis; that the brawl in front of the Turkish Ambassador’s Residence was caused by the failure of local security authorities to take necessary measures; that this incident would not have occurred if the U.S. authorities had taken the usual measures they take in similar high level visits and therefore that Turkish citizens cannot be held responsible for the incident that took place,” read a part of the statement. “It has been emphasized that the decision, which clearly was not taken as a result of an impartial and independent investigation, is unacceptable,” concluded the Ministry’s statement. According to Hamparian, the move to condemn the decision to charge the members of the security detail is an attack on American values. “Having intimidated U.S. leaders into silence on the Armenian Genocide, basically enforcing a foreign gag-rule on what we can say about our own American history, he’s [Erdogan] now targeting our values, telling us when we can and cannot speak out as U.S. citizens,” Hamparian said. During a press conference on June 15, Washington D.C. Mayor Muriel Bowser and D.C. Police Chief Peter Newsham announced that arrest warrants have been issued for the arrest of 12 members of Turkish President Recep Tayyip Erdogan’s security detail and Turkish police officers in connection with the May 16 attack on peaceful protesters in front of the Turkish Ambassador’s residence in Washington, D.C. 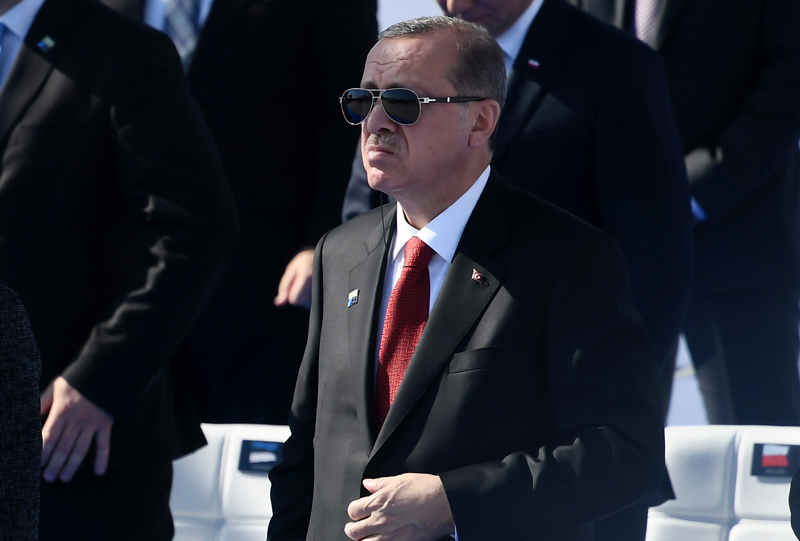 The President of NATO "ally" Turkey, Recep Erdogan, is now, by all accounts, the subject of a U.S. law enforcement "probable cause" investigation regarding his possible role in ordering the May 16th attack on peaceful Washington, DC protesters. That's the power of viral video and a real tribute to your fast action via social media to spread word of this attack worldwide. Thank you! — at Armenian National Committee of America. It's much easier if you just keep erDOGan out of the country, the problem is solved! BERLIN, Germany (A.W. )—Germany’s Foreign Affairs Ministry has cautioned Turkish bodyguards involved the attack on peaceful protesters in Washington D.C., not to attend the upcoming G20 summit next month. According to several German media outlets, the warnings to the bodyguards were then repeated to Bundestag (Parliament) members in closed-door meetings. On July 7-8, leaders of the G20 nations will gather in Hamburg, Germany, for their annual summit. The Turkish Embassy in Berlin sent the German Foreign Ministry a list of 50 individuals who were to accompany Erdogan to Hamburg, which included several agents who were involved in an incident in Washington, according to the daily Hamburger Abendblatt. On May 16, a group of peaceful demonstrators protesting Turkish President Recep Tayyip Erdogan’s official visit to the United States, were attacked by pro-Erdogan groups—including members of Erdogan’s security team—at the Sheridan Circle near the residence of the Turkish Ambassador to the U.S.
During a press conference on June 15, Washington D.C. Mayor Muriel Bowser and D.C. Police Chief Peter Newsham announced that arrest warrants have been issued for the arrest of 12 members of Erdogan’s security detail and Turkish police officers in connection with the May 16 attack on peaceful protesters in front of the Turkish Ambassador’s residence in Washington, D.C.
On June 6, with a vote of 397 to 0, the U.S. House of Representatives unanimously condemned Turkey in response to the attacks, taking a powerful stand against Ankara’s attempts to export its violence and intolerance to America’s shores. Germany's Foreign Ministry warned Turkish President Recep Tayyip Erdogan against even appearing at a Turkish consulate or speaking via web video link during his visit to Germany for G20 summit, DW reported. According to him, the government of Germany had options for influencing such actions. ANCA "A Democratic lawmaker from Rhode Island is seeking to block the U.S. sale of Lockheed Martin-made F-35 fighter jets to Turkey over an attack on protesters outside the Turkish ambassador’s residence in Washington two months ago. Rep. David Cicilline, a member of the Foreign Affairs Committee, has proposed the ban as an amendment to the 2018 National Defense Authorization Act, which was passed by the House Armed Services Committee last month. The House is expected to take up the bill and deal with amendments next week."